Chris and Sonja - The Sweet Seattle Life: Earthquake!!! LOS ANGELES — A moderately strong earthquake shook Southern California on Tuesday, swaying buildings and tossing food off grocery store shelves for about 20 seconds. There were no immediate reports of major injuries or structural damage. 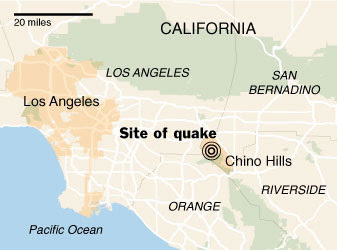 The quake, estimated at 5.4 magnitude (reduced from an initial estimate of 5.8), was centered 35 east of downtown Los Angeles in Chino Hills, just south of Pomona in San Bernardino county. It was felt as far east as Las Vegas and as far south as San Diego. Rest of the article here. Graphic: NYTimes. Well, we can say that we've safely lived through our first California earthquake. Actually, only Chris and Bailey can say that since I was up in San Jose today for a business trip. Evidently it was quite exciting for Chris: he works on the 10th floor of a large office tower. Cell phone lines jammed immediately after the big event so I got the following text: We just had an earthquake. I'm ok. Can't get a call through. Things here at the house are fine; Bailey seemed a little stressed out but it snoring away at my feet so his earlier distress is clearly a thing of the past. I'm almost bummed that I didn't get to use my super, awesomely-prepared earthquake survival kit that has been patiently waiting in the garage these last four years. Almost, but not really. Glad to hear you are all okay. Thought about you as soon as I heard.